The Mississippi Department of Environmental Quality (MDEQ) issued a water contact advisory Wednesday for several streams near Taylorsville. 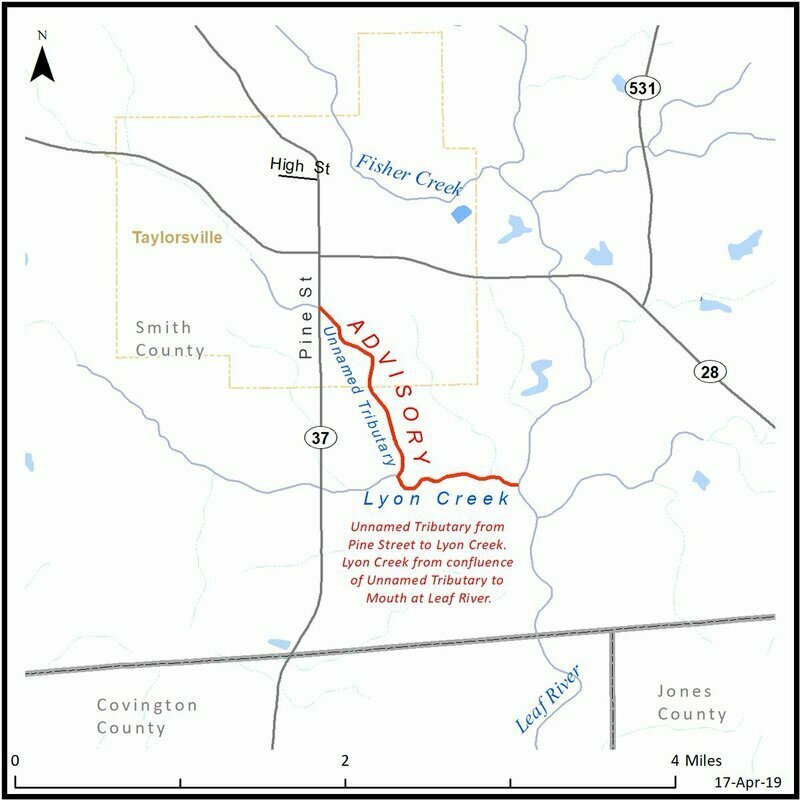 The advisory is issued for an unnamed tributary of Lyon Creek where it crosses Pine Street to the confluence of Lyon Creek with the Leaf River. The advisory is being issued due to an ongoing bypass from a sewer line, and the city is currently working to repair the line. MDEQ recommends that people avoid water contact such as swimming, wading, and fishing. People should also avoid eating fish or anything else taken from these waters until further notice. MDEQ staff will collect samples and monitor the water quality in the area and will revise the advisory as needed. We want to stress that this advisory DOES NOT impact our drinking water supply, and boiling your water is NOT neccessary. This advisory is simply for the unnamed streams. The town is actively working to repair the bypassed sewer line, and we anticipate repairs should be completed within the next week or so. ​Good afternoon, Taylorsville. The NWS has released their preliminary report of the tornado that occurred this weekend just to our southwest. We remain ever grateful and blessed that this dangerous tornado did not make it to the heart of Taylorsville. A special thanks to all of our emergency management personnel and those who assisted in the response efforts after the tornado. Summary: This tornado touched down at the intersection of Boyd Duckworth and Lilly Valley Church roads. Some broken limbs and a few downed trees were noted along with skirting blown from a mobile home. Heading northeast, limb damage increased along with a few more trees blown down. The covering from a porch and the tin roof of a mobile home was taken off. This debris was thrown into another mobile home and caused the door to fly open, which this debris caused a minor injury. Other minor tin damage occurred to a few mobile homes here. Tree damage increased as it crossed Decar Page Drive, with EF1 type tree damage continuing as it neared Gilmer Road and crossed Gilmer Road. One home had shingle damage and had the base of the roof lifted some. As the tornado crossed into Smith County, it reached peak intensity and numerous trees were snapped and uprooted. As the end of County Road 21-D, heavy tree damage was noted. One home had the carport removed and residents said the house shifted. Some of the tin roof was damaged as well. As the tornado moved northeast along County Road 21, a large metal shed had the roof removed. 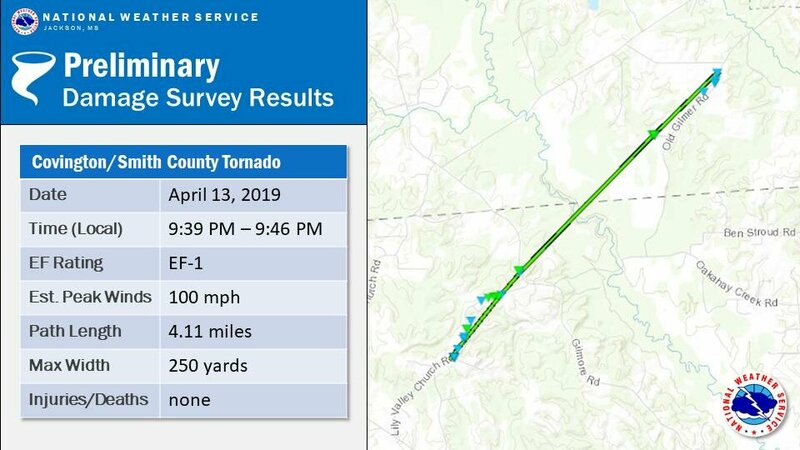 The tornado dissipated shortly after near County Road 21 about 2 miles southwest of Taylorsville. An indirect injury occurred in Smith County when a lady fell off the roof while putting a tarp up. 2018-2019 Social Media Corps Applications Now Available! ​The Town of Taylorsville is pleased to announce that we are looking for talented people to apply and join our Social Media Corps! The Social Media Corps is tasked with providing news coverage on the city website, city social media accounts, and working closely with the Mayor's Office and the Chamber of Commerce to promote and engage the community in events. The Social Media Corps will be a five to ten-member team led by Brandon Henderson. Brandon is a graduate of Taylorsville High School, the Smith County Career Center, and is attending the University of Southern Mississippi. Members of the Corps report to the Mayor. This position is VOLUNTEER only. You receive no compensation for this role. Students enrolled in a public school in Smith County can receive community service credit for their time served with the Corps. - A desire to keep the citizens of Taylorsville and southeastern Smith County informed of news and events in our community. - A mobile device or phone running iOS 10 or later, or Android Oreo or later. The Town of Taylorsville has adopted an equal opportunity policy for this recruitment drive. Race, religion, ethic background, sexual orientation, WILL NOT disqualify you from serving on the Social Media Corps. All applicants will be considered on the same basis. I am pleased to announce that applications are now available for the 2018-2019 Mayor's Youth Council session. Students in grades 7-12 for the 2018-2019 school year who attend Taylorsville High School may participate in the program. The Mayor’s Youth Council is made up of 25-30 students. Applicants from other schools will be considered if the student lives in the Town of Taylorsville. Students selected for the youth council must maintain a 2.5 grade point average and have a recommendation from school and community leaders. Potential applicants can pick up an application from Town Hall or on the Youth Council page on the website. All applications are due by 5:00PM on Friday, June 8th. There are two recommendation letters required for each student. These recommendations should be a school administrator, teacher, or community leader. They should be emailed from the reference directly to kelliephipps@taylorsvillems.com. Once you have completed your application and responses, staple your information and drop it off at the town hall. If you are unable to drop off your application, you may scan and email it back. You may also mail your application, but we are not responsible for lost or delayed applications. It is your responsibility to make sure a completed application is received. I look forward to reviewing all of the applications. Our community is full of bright students with amazing potential.